Owen’s musical career has encompassed many aspects of the performance world; he has held positions in the City of Birmingham Symphony Orchestra and, as a principal, in the BBC National Orchestra of Wales, as well as working with numerous other orchestras including the Scottish Chamber Orchestra, Northern Sinfonia, BBC Philharmonic, Royal Liverpool Philharmonic and the Royal Philharmonic Orchestra; he has been a member of several quartets whose work has included concerts in the USA, Finland, Belgium and Germany, including a live performance on Netherlands radio, and was most recently a member of the Galitzin Quartet. 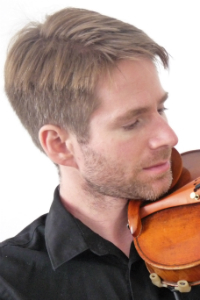 Owen’s education spanned both the performance and academic spheres, having attended Chetham’s School of Music, Cambridge University, the Royal Northern College of Music, Northern Illinois University in the USA (where he studied with the renowned violinist, Shmuel Ashkenasi) and continues to combine both worlds as he pursues a PhD in Performance at Cardiff University researching recordings of Beethoven’s String Quartets. In recent years Owen has become a dedicated teacher, having been a violin and chamber music Instructor at Trinity School of Music, Junior Department, Head of Strings at Ibstock Place School in London, and Instrumental Teaching Professor at the Royal College of Music before joining the Chetham’s as Assistant Head of Strings in September 2013. He is also an Honorary Lecturer in Performance at Nottingham University where he regularly directs and performs concertos with the students there.